At Ocean Life Education, we love to educate the public about safety in the water, especially concerning sharks. There’s been much discussion around sharks recently following several incidents with surfers at popular Eastern beaches. We thought this was a great time to team up with Channel 10’s Totally Wild to clear up some common misconceptions. This week, we headed to the beach with Totally Wild to film a segment on why people encounter sharks, why sharks make mistakes and how best to avoid contact with sharks. Our view is that the better educated the public is about sharks the better choices they’ll make, and therefore the safer they will be. Sharks are important to the marine ecosystem, we need to learn to live with them and look after them, to maintain a healthy ocean. Don’t swim too early in the morning, too late in the afternoon or at night. Don’t swim in dark or murky water, especially near rivers or estuaries. Don’t swim at beaches near rivers after heavy rainfall. Don’t swim in areas where sharks are known to visit. Swim between the flags, where lifesavers are watching out. There is a reason for where they put the flags and when they open and close the beach. Understand sharks, be educated and mark responsible choices when and where to go into the water. The Sunshine Coast Daily were aware of us filming the segment and thought the timing was right to put an article in last Tuesday’s paper to help spread the message. Read the full article on the Sunshine Coast Daily website. The filming with Totally Wild went well and we will let you know when it’s going to air. Keep an eye out on our Facebook page. My only reservation – the SC Daily could have used more touch up flare on the picture of yours truly in the paper! This entry was posted in Media and tagged media, Ocean Life Education, public education, sharks, sunshine coast on November 26, 2015 by oceanlifeeducation. Wow what a ride the last few weeks have been! 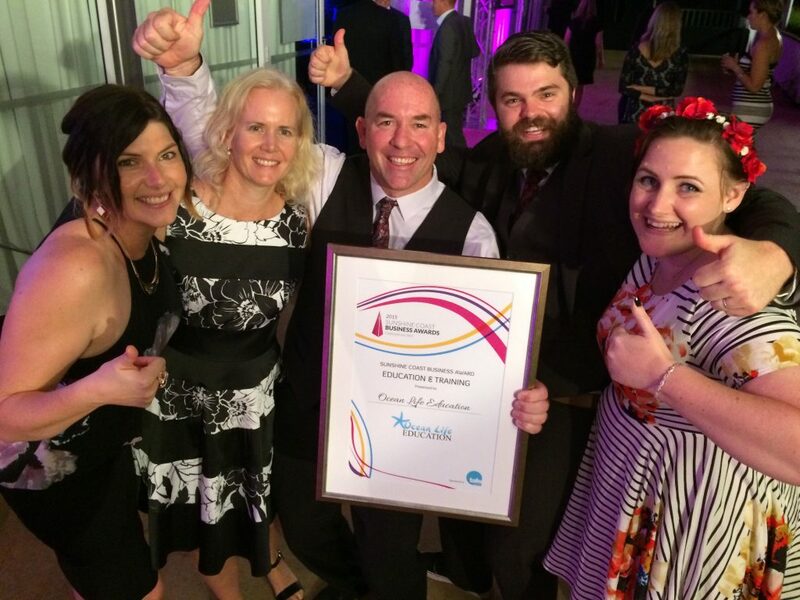 We are very happy to have won the Sunshine Coast Business Award for Education & Training. A real testament to the wonderful staff that help make us a fantastic and effective educational resource. A huge thank you goes out to all you amazing teachers at schools, child care centres and vacation care that invite us in and let us help breed new generations of environmentally savvy custodians. Our business is not successful without you and your ongoing support. We look forward to maintaining our relationship and continuing to make environmental learning fun, engaging and interactive. 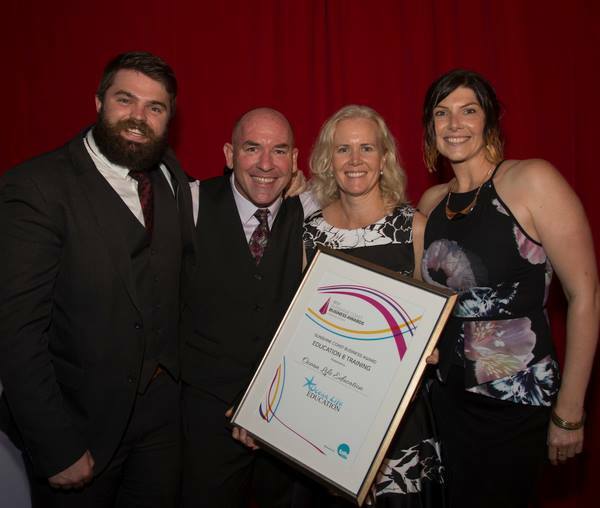 Tracey and Richard attended the Gala event at the Novotel Twin Waters along with Alison (marketing) and Nathan (presenter) with wife, Lauren. Needless to say we were all so happy for the recognition of Ocean Life Education, a business with purpose that we are all so passionate about. Tracey and Richard Coward, just moments after receiving the award. Here’s Tracey and Richard receiving the award. Richard kept the acceptance speech short and sweet but said “receiving this award is a win for the environment”. 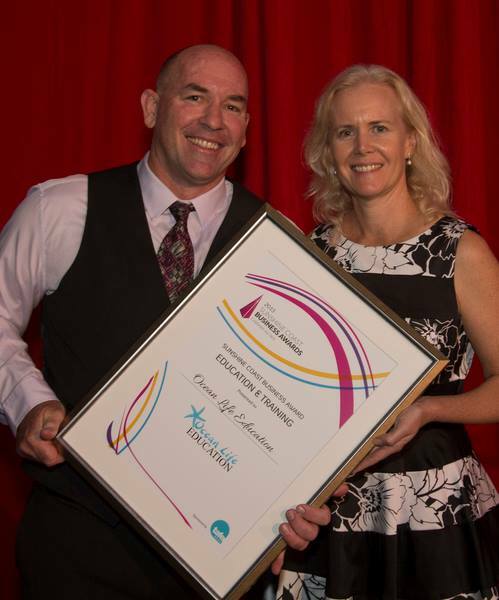 You can check out more photos from the Sunshine Coast Business Awards event on our Facebook page. 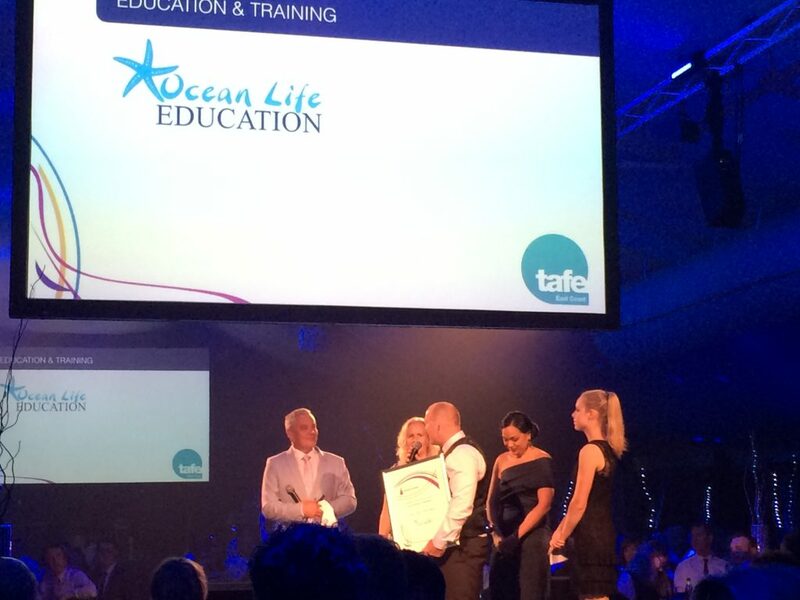 This entry was posted in Media and tagged Awards, business, media, sunshine coast on November 25, 2015 by oceanlifeeducation.